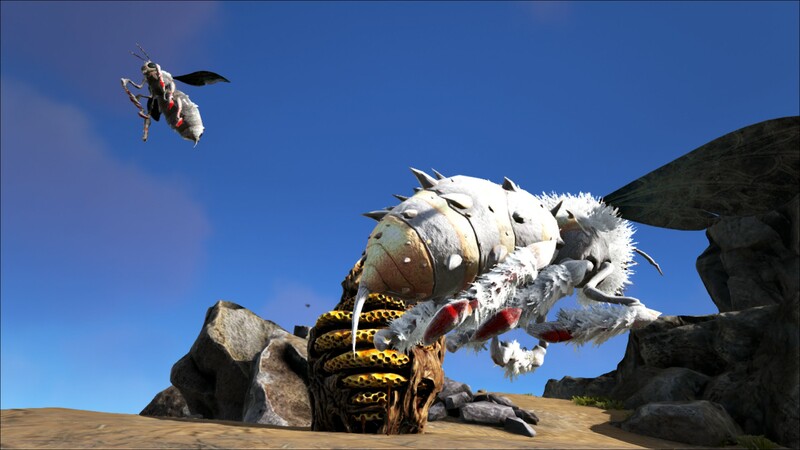 The Giant Bee (jai-ahnt-bee) is one of the Creatures in ARK: Survival Evolved. In the wild, Apis lithohermaea Drones never stray far from their nests, which they build high in the Island’s Redwood trees or on rocky cliffsides. Apis Drones can be seen swarming around the nest in groups, but to get a look at the Queen Apis, one would need to crack open the nest itself. Speaking from experience, this is not a pleasant task, as the untameable Apis Drones are quite territorial. I probably should have seen that one coming, in hindsight. Take caution: Apis stings will significantly weaken any creature which suffers them, and because its stinger is not barbed, Apis can sting multiple times without its stinger being ripped away. A tamed Apis Queen will lay new drone eggs, and construct a nest that survivors can farm for honey, so long as they remember to wear specialized bee-keeping gear. Said honey is not only sweet and delicious, but laced with scents that land mammals find irresistible. Many hunters use it to bait their traps. Apis Drones will also follow their Queen into battle, so they can be used for self-defense in a pinch. General: The entity that is the Giant Bee consist of the Queen Bee and the drone (called Giant Bee in game). Queen: The Queen Bee is the center of the Giant Bee entity. She is the larger of the two that players will encounter. When she spawns into the world, she automatically becomes a hive. Note that the Queen may despawn shortly after spawning in and turning into a hive, even when she is spawned in by a player. Wild Queens will spawn drones to protect her while she flees from the recently destroyed hive, and will keep spawning them after tamed. Once tamed, she can be interacted with like other pets but she does not gain XP and cannot level up past the post tame additional levels. (+2 max on a private game) She tends to spawn at level 5. She has an inventory that can have items placed in it, and a food bar but it does not drain very fast. From tests, she can eat both raw meat and Rare Flowers, but seems to require hand feeding. The Queen will continuously spawn drones that seemingly do not count towards the player's tame count, as they do not show up as red in the kill feed if killed by the owning player or fellow tribe members. Drones: Drones are smaller of the two Giant Bees. They will spawn from inside a wild hive and will swarm any attackers. Once the Queen is tamed, they can be interacted with the exception of having an inventory or a progression system. They can and will protect the player if their aggression is not set to Passive. They can also follow the player, but only a certain distance before returning to the Queen. Giant Bee drones can be uploaded to a Beacon or Obelisks, and can be redownloaded. If they are downloaded, they will be severed from the Queen and can be used as guard dogs. However, like Forcetamed Titanoboa, they cannot be fed or leveled up, and will despawn when the player reloads the same world. Drones cannot be acquired from a tamed hive, and are only produced by a tamed Queen. She will only produce a certain amount, and the Drones seem to have lifespans. Sometimes they will live for 30 minutes or so and sometimes they will die en masse within a few seconds of spawning. Displayed are the Queen Bee's natural colors. The drone bees it spawns have different colorization. This section displays the Giant Bee's natural colors and regions. For demonstration, the regions below are colored red over an albino Giant Bee. The colored squares shown underneath each region's description are the colors that the Giant Bee will randomly spawn with to provide an overall range of its natural color scheme. Hover your cursor over a color to display its name and ID. For example, "cheat SetTargetDinoColor 0 6" would color the Giant Bee's "body highlights" magenta. The bee drones (not the Queen) bite the target. The bee drones (not the Queen) sting the target. This attack will remove players from their mounts. This section describes how to fight against the Giant Bee. These things are pure annoyances. You choose when to engage, so you can prepare with ample time to do so. Just don't be stupid, and don't walk into other creatures and you're fine. Performing a barrel roll with a Pteranodon is a relatively safe way to destroy the hive without wasting too many resources such as bullets. If the barrel roll is aimed correctly, the Pteranodon damages the hive with more damage than its regular attack, and the barrel roll also allows the rider to move past the hive fast enough in order to not get stung by the Drones. Rocket Launchers are also great against wild hives. Another great way to destroy a hive is by using a Direbear as Direbears have a buff that makes you and the Direbear immune to bees. Ranged weapons and pikes or spears are effective against the drones. Stings will dismount riders and slow players, making them easy targets for the swarm. Their small size makes them difficult to hit at times, and they move at a fair pace, allowing them to chase any assailant attempting to raid the hive. The drones are fairly slow and have low health, making them easy targets for ranged weapons. The Giant Bee is a passive tame. You have to crack open the hive to get to the queen, then feed it Ichthyornis Kibble or Rare Flowers. She will also eat Raw and Cooked Mutton. Some hives are empty though. If the hive is occupied, a swarm of Giant Bees will come out and attack the person who damaged it. You can check without damaging the hive, however, by staying near it and listening for the sounds the queen makes, as she can be heard beating her wings and occasionally buzzing from inside. Only occupied hives have a Queen - empty ones just have some honey to harvest every 15 minutes (press e, , on the hive). Use a dino or shoot the nest until it breaks. You can also build a Wooden Pillar under the hive and place a C4 Charge on top of the pillar to take the hive out in a single blast without having to worry about getting stung. The Queen will slowly descend towards the ground where you can begin taming. You can use a Quetzal or another flying mount, but be warned, if it gets stung you will get dismounted. A Quetzal with a Platform Saddle is the best option due to its high AOE (area of effect), and you won't be thrown far if you're dismounted. Try not to accidentally kill the queen. Sometimes the queen gets stuck in the tree and will not move from where her hive was destroyed. One very effective method to gain access to a queen is to use Dimorphodons as they are extremely efficient for breaking open bee hives and aiding in the taming of the queen, arguably more so than using firearms or explosives. Being flyers, a small swarm of Dimorphodons can easily reach and quickly break open any hive when whistled to attack it, without angering the drones, provided the player keeps a far enough distance away while they do this. Once the hive is broken and the queen is exposed, they can be whistled to passive and brought back, without harming the queen or drawing the attention of drones so long as they are called back quickly enough. 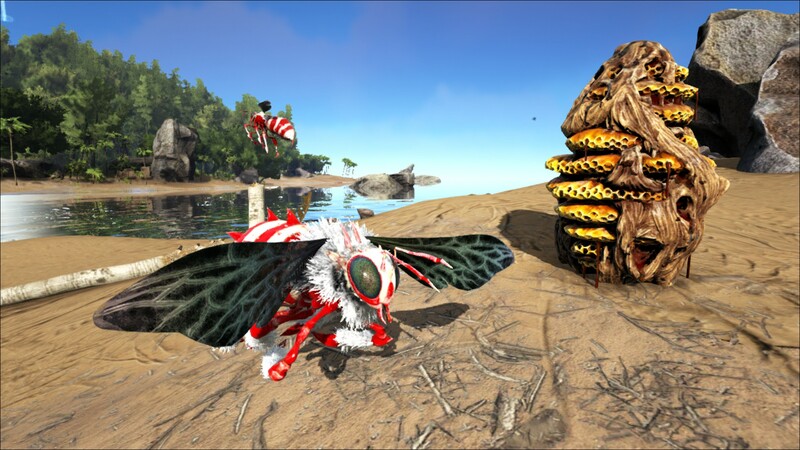 Once returned to the player's position, they can be set to neutral to guard any mounts or other tamed dinos while the player is occupied with the long-chase process of taming the queen bee. A suggested mount to use while searching for bee hives, that pairs nicely with the Dimorphodons, is a Tapejara. With their maneuverability in flight, they make controlling the camera and spotting wild hives that much easier. Once the hive is broken and the queen exposed, use a Ghillie Suit to prevent stings, as well as Bug Repellant to get close enough. Feeding your dino Bug Repellant does work in combination with your repellant. This allows you to get close enough without angering the drones. However, if you get too close or touch the queen, the drones will become angry and attack regardless. On Scorched Earth, they are found exclusively on the walls of the canyon that runs through the middle of the High Desert, near Canyon Cave. Sometimes it is possible to get more than one Queen from the wild hive. Beehive: When tamed, There is a prompt displayed over the queen bee: "press e, , to obtain hive". When doing so, a Bee Hive is being placed in your inventory and the queen bee disappears. The hive can then be placed like smithy or other structures and produces Giant Bee Honey. Be sure to be wearing a full Ghillie Suit, with nothing in your off-hand slot, while touching the nest, otherwise you will be stung. The hive needs Rare Flower to "stay healthy". When destroyed, the Giant Bee that was used to build the Bee Hive will respawn which can then be used to create a new Bee Hive. A quick tutorial on how to make a bee trap to get honey easier in the Redwoods. Dino Dossier revealed on 09/20/2016. The Giant Bee's scientific name Apis lithohermaea is that of an actual species of giant bee that dwelled in Miocene Japan. Of course, the real animal was much smaller at only 18 millimeters. The giant bee is the third creature to have a queen, with the first being Araneo (Broodmother Lysrix), the second being Titanomyrma, although the Titanomyrma queen is not currently in-game, and fourth one is Nameless (Reaper Queen). The dossier may reference possible apiarist armor in a future update. When a player-made hive is destroyed, the bee will be facing to the right of the original orientation of the hive. 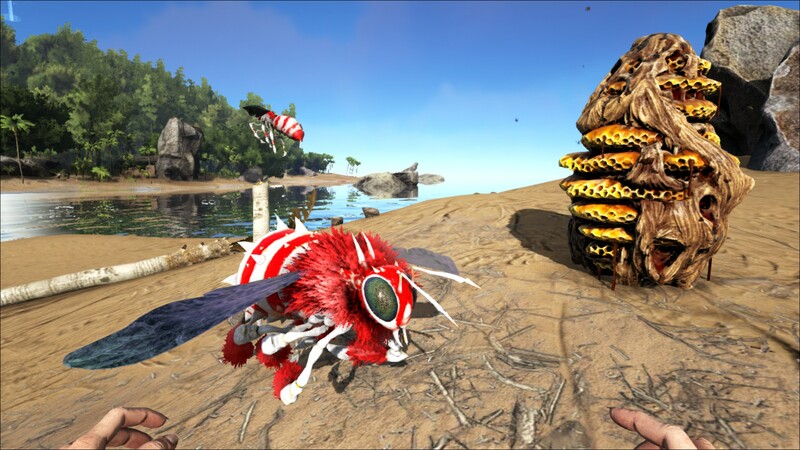 Player-made hives in Aberration destroyed will not 'refund' Giant Bee. Be advised if you intend to transfer the bee to another map as Bee Hives cannot be transferred anywhere. As of Patch 291.102 (PC) and 781.16 (Xbox), player created Beehives may be picked back up after ~5 seconds, giving the player their Beehive back as well as another Queen Bee being created. ↑ Introducing the Giant Bee!